The state of Virginia is populated with 22 parks managed by the National Park Service, those places run by the rangers dressed in green and wearing those particular brown hats. Yet many of these park units are not traditional national parks like Virginia’s own Shenandoah National Park, but rather important historical and cultural sites such as Manassas Battlefield or Cape Henry Memorial or Booker T. Washington Monument. While these other national parks can be delights in their own right, let us delve into seven Virginia’s national parks that cater to outdoor lovers like you and me. Learn about the wealth of recreation opportunities available at these federal preserves, and perhaps visit a national park to which you’ve never been or become reacquainted with an old favorite. After all, Virginia is for outdoor lovers. Don’t be confused by the name, this park is historical but that history is melded onto a mountain of monumental beauty. Located where Virginia, Tennessee, and Kentucky converge, Cumberland Gap National Historical Park, inspired by nothing less than Daniel Boone’s opening of the Wilderness Road into Kentucky, overlays an historic theme on the park’s abundant natural features. This combination offers the visitor plenty to do and see. See Cumberland Gap’s history up close and in person. Walk to the monument at the actual Cumberland Gap, restored to its natural appearance when it became the key passage of the Wilderness Road. Visit an iron furnace, remnants of two Civil War forts and a pioneer settlement. Natural features include Skylight Cave, Cudjo Cave and far reaching views from the Pinnacle and my personal favorite, White Rocks, plus a host of other vistas. One of Virginia’s under visited parks, this 20,000-acre preserve has an auto accessible campground with an adjoining picnic area, situated on a heavily wooded sloping ridgeline. Its 160 sites, some with electricity, sprawl widely under thick woodland of pine, dogwood, oak, maple and hickory, delivering superb privacy. Three full service bathhouses serve the campground. The campground never fills — this is one place you can always count on getting a campsite. A system of trails short and long spurs directly from the Wilderness Road Campground. The Lewis Hollow Trail leads to Skylight Cave, and the Pinnacle and the Gibson Gap Trail. Alternatively, drive over to the Cudjo Cave Area and take the Wilderness Road Trail to the Tri-State Trail and Tri-State Peak, where you can stand in Virginia, Kentucky and Tennessee at once. Take a ranger-guided walk back in time to the Hensley Settlement, a collection of pioneer homes that rivals any assemblage of historic pioneer sites. Perched 3,400 feet high in the Cumberlands, springhouses, wooden fences, a graveyard, and an old schoolhouse complete the reality of the abandoned community. The Hensley Settlement is absolutely worth a visit. Tour reservations are recommended. You can also hike there on your own. Backpackers can hit the trails and stay at designated sites with a permit. Stop at the park visitor center, learning from displays about Cumberland Gap. While you are there, you will likely find more reasons to explore the preserve. I bet you didn’t know the Appalachian Trail is a national park, the longest and skinniest park of them all. Virginia claims a stunning 550 miles of the 2,135-mile Appalachian Trail, over a quarter of the entire path stretching from Georgia to Maine! Elevations along the AT in Virginia range from nearly 5,700 feet near Mount Rogers to under 600 feet in northern Virginia. That’s almost a mile of vertical variation! Don’t we all wish we could hike the Appalachian Trail all the way through Virginia? What an adventure that would be! Sooner or later some of us will. However, for most of us AT enthusiasts, walking the entire AT in Virginia will remain an elusive goal. However, we love the AT and want to explore and enjoy the trail when and where we can, places like Virginia’s Jefferson and Washington National Forests, collectively availing millions of acres of untamed forests, rich with flora and fauna. Then there are the national parks the AT explores –Shenandoah National Park and the Blue Ridge Parkway. Virginia hosts a profusion of experiences and sights along the Appalachian Trail. Day hikers can hit the highlights. Start with American’s most famous trail town – Damascus, then move north to Mount Rogers, Virginia’s high point at 5,729 feet. Traverse open meadows of Chestnut Knob to visit a ranger cabin turned AT trail shelter. Solitude can be found on the AT. Walk from Rocky Gap near Blacksburg to grab a view from Kelly Knob. Hike wind stunted pine ridges flanking the path near the Dragons Tooth. Peer out from the rocky brow of Virginia’s McAfee Knob. Hunt for the ghost of Ottie Powell atop Bluff Mountain. View adjacent talus slopes from the edge of The Priest. At Shenandoah National Park, use the AT and connecting trails to form loops, and visit a streamside presidential retreat, view multiple waterfalls from Browns Gap, or capture the essence of the Blue Ridge and Shenandoah Valley from Marys Rock. Walk through fern gardens lining the AT on the slopes of Stony Man Mountain. Though the Appalachian Trail may be long and skinny, this Virginia national park is heavy with places to see and things to do for outdoor lovers. The name Blue Ridge Parkway denotes the first and foremost element of this national park Virginia shares with North Carolina: a scenic driving road being the centerpiece of this national park. Though visitors primarily connect with nature by driving the Parkway, they also do so by pulling over at overlooks, soaking in the vistas, by hiking on foot trails spurring from the parkway, camping at parkway campgrounds, viewing adjacent waterfalls and … well there’s a lot to do at this linear national park, 216 miles of which roll through the Blue Ridge in Virginia. Outdoor lovers will find the Parkway’s beginning near Waynesboro. From mile 1 to mile 216, the scenery never fails to please the eye. And beyond-the-car activities await as drivers head south. See the historic William J. Carter Farm on a short nature trail near the parkway’s origin. There’s a visitor center here, too, to help get you oriented and organize your particular pursuits, whether they are corralling views from peaks like Humpback Rocks, or Flat Top Mountain, or Smart View, or the meadows of Rocky Knob, or heading to waterfalls like White Rock Falls, Apple Orchard Falls or Fallingwater Cascades. Perhaps you’d rather see cultural sites such as the Puckett Cabin, home of an Appalachian midwife, or the Johnson Farm, a site restored to the 1930s. The most popular cultural site without a doubt is Mabry Mill, where a gristmill, complete with waterwheel, presents a slice of our past that leaves Parkway enthusiasts wistful for the relaxed days of yore. And relaxation is an important component of any Blue Ridge Parkway adventure. Overnighters can stay at the Peaks of Otter Lodge, at the center of a diverse trail network. Campers can pitch a tent at four facilities along the parkway, if you include Sherando Lake, which is just off the parkway and technically part of the Washington National Forest. Of special note is the Blue Ridge Parkway Music Center, a venue where traditional Appalachian music is played and special concerts are held. Even the music center has adjacent hiking trails! You could think of Virginia’s Blue Ridge Parkway as a linear dining table loaded with courses to satisfy your outdoor appetite, even down to the dinner music. Shenandoah is Virginia’s signature national park. Located entirely within the state, the 200,000-acre mountain preserve stretches 70 miles down the Blue Ridge. Within its confines are over 500 miles of paths, 101 miles of which are the Appalachian Trail. Skyline Drive, winding for 105 miles through the park, is often plenty to keep a visitor busy. Between the hiking trails and scenic road, countless breathtaking views can be found (Well, the official overlooks on Skyline Drive can be counted. There are 75 of them). 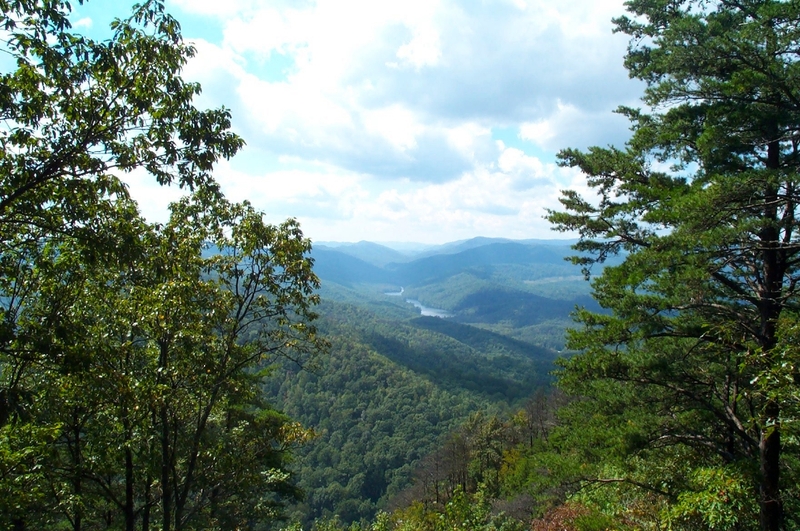 Vistas – whether from roads or trails — harbor mountains stretching north and south, or Shenandoah Valley and the Appalachian Plateau to the west, or the rolling Piedmont to the east. After all, over 60 peaks in the park rise above 3,000 feet. Conceived in the grand national park tradition, Shenandoah has additional recreation opportunities and facilities. The park presents two lodges – Skyland and Big Meadows. Parts of Skyland Lodge precede the dedication of Shenandoah in 1936. Cabins can be found at both of these lodges and at Lewis Mountain, for those who want a semi-rustic setting for their national park lodging experience. Four auto accessible campgrounds are spread throughout the long and narrow park, so pitching your tent or pulling up your camper is easy, too. In addition, for those who want to camp in the back of beyond, backpacking is allowed within the park – with a permit and under guidelines. Other facilities include visitor centers and entrance stations, great places for getting oriented during your Shenandoah experience. Picnic areas provide outdoor dining locales and waysides — small roadside stores – avail a chance to pick up something you forgot, or purchase a souvenir. Outdoor lovers will also find a variety of ranger programs held at campgrounds and visitors centers. Here you can learn about wildlife, history and culture of this most famed of Virginia’s national parks. However, the most important thing is getting out there, heading to 93-foot Overall Run Falls, visiting the still intact Corbin Cabin from pre-park pioneer days, or hiking to a craggy overlook on Furnace Mountain. Perhaps your thing is angling for trout in a clear stream. Or maybe it’s looking for the abundant number of wildflowers in spring. No matter, just get out there and enjoy Virginia’s masterpiece of a national park – the one and only Shenandoah. Have you ever seen the Great Falls of the Potomac? The crashing whitewater wonder is truly a natural highlight of Virginia. Like Cumberland Gap, Great Falls is also overlain with history. George Washington himself commissioned a system of canals and locks to allow barge traffic to navigate around this extensive whitewater froth hurtling through Mather Gorge. On your visit, view the falls, the locks, canals, and even the ghost town of Matildaville, built for the men and their families tending the lock and canal system. Great Falls is a discovery in human and natural history. The Great Falls are just that — great — and a sight to see. Young George Washington, as he traveled the Potomac then surveyed interior lands of the Ohio River valley, saw this roaring cascade, admiring its beauty yet decided the Potomac River would be an essential trade corridor if only the Great Falls and other, lesser rapids could the bypassed. An idea was born – a canal system on the Potomac River. What became the Patowmack Canal took the long time to build. Great Falls would prove formidable. Along this point, the Potomac descends 70 feet in a mile, dropping from the Piedmont to the Atlantic coastal plain through a rugged gorge of exposed bedrock. In addition, remember, this canal was dug using 1700s technology that meant backbreaking labor, although crude and dangerous blasting with powder was used. Today, the history here is preserved and recreation opportunities added to the park. Anglers can fish the Potomac but the ban on swimming or wading cramps their efforts. The ban is to present reckless climbing in and around the massive rock-strewn cataracts of Great Falls. The Great Falls trail system has something for everyone. 15 miles of pathways are open to hikers, 10 miles of trail open to equestrians and 5 miles of trail for bicyclers. Bring a meal with you – the park has a large, alluring picnic area. Great Falls even offers a climbing area, with routes extending from 25 feet up to 75 feet high. Come to Great Falls and have a great time. Established as a demonstration work camp built by the Civilian Conservation Corps during the Great Depression, Prince William Forest Park presents a network of trails, streams and camps containing glimpses of the past, from old buildings to former pyrite mines operating along North Fork Quantico Creek. The park is the largest preserved tract – over 15,000 acres — of Piedmont forest in the Virginia. Furthermore, campers can enjoy auto accessible camping and backpackers can rough it at a backcountry campsite, all within the greater metro D.C. area. With a large populous nearby, the park is big on ranger programs for young and old. Learn about the spies of Prince William Forest or the former industrial past of this now-natural destination. Interestingly, even the park’s trail system was initially laid out by the Civilian Conservation Corps. The Pine Grove picnic shelter is a good example of the many structures built during their time. The buildings all share the commonality of being rustic wood and stone buildings in the pioneer style commonly seen in our national park system. Today, hikers have 37 miles of pathways to explore, spread over 16 trails, ranging from treks to streams, wetlands, and historic sites. Bicyclists can take to the paved roads or backroads. The primary park road — Scenic Drive — lives up to its name and provides a quiet, lesser-traveled place to pedal on pavement. You can make a 7-mile loop on Scenic Drive. Burma Road is a gravel track with hills aplenty for a more challenging experience. Several other gated gravel roads are available for two wheelers on the move. Campers have three different options for overnighting at Prince William Forest Park. Oak Ridge Campground is used primarily by tent campers. Three wooded loops are set in rolling woods with 100 sites available. The A Loop is first come, first serve only. However, reservations can be made for B or C loops. Hot showers, flush toilets and drinking water are available. RVs and campers may want to use Prince William Forest Large back up or pull-through campsites with full hookups allow RVers to plant themselves then explore Prince William Forest as well as Manassas Battlefield and other Washington, D.C. attractions. Finally, backpackers can make a loop hike in the Chopawamsic Backcountry Area to primitive campsites, adding a wild touch to their Prince William Forest experience. What will be your Prince William Forest experience? Assateague Island is long sandy barrier on the east coast of Virginia extending into Maryland. The Virginia portion of Assateague is mostly wildlands – and wild beach, with little in the way of developed facilities, save for the Toms Cove Visitor Center. The rangers there dispense maps, have a bookstore and restrooms. The nearby town of Chincoteague does have amenities such as camping, lodging and dining. To get to Assateague you must pass through adjacent Chincoteague National Wildlife Refuge and the town of Chincoteague. Beachcombing along the Atlantic Ocean is popular at Assateague Island. About 10 miles of wild shoreline lie between the ocean access near Toms Cove Visitor Center and Maryland state line to the north. Head south along the beach and you can find the restored Assateague Island Coast Guard station. This two-story wooden building with observation tower and adjacent outbuildings, along with a boathouse, was constructed in 1922. It was occupied for nearly 50 years before the shifting barrier island and the shallowness of water access became the station’s undoing. The park preserved the station, now a designated Virginia historic landmark. The lighthouse at Assateague is a big draw. In 1833, the first Assateague Lighthouse was built but was found to be too short and too dim. A second lighthouse, the one we see can visit today, was begun in 1860 but not completed until 1867, as the Civil War interrupted its progress. This lighthouse, 142 feet in height, was built on a high wooded dune. The oil burning lamps required constant maintenance. For a century lighthouse keepers lived in the shadow of the red and white striped beacon. Today you can hike to the lighthouse on a short trail and visit the historic circular tower. For a fee you can climb up it when open. Come on out to Assateague and find your slice of wild Virginia national park shoreline. The Harbor Blast Community concert series celebrates its 20th year raising money for area charities beside the Appomattox River at the Appomattox boat harbor. Family friendly fun, live music, food and beverages, games and activities. Come by land or by boat.